The gravestones are located within a railed enclosure to the west of the church building, near the back of the kirkyard. The new railings were erected by the SCMA. 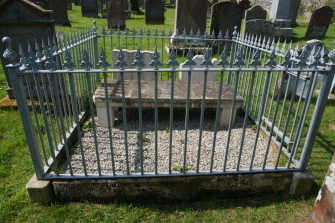 An enclosure in the kirkyard at Wigtown contains three gravestones to the various Wigtown Martyrs. The tablestone commemorates Margaret Wilson. The headstone to the rear (left) is to Walker, Johnstone and Milroy. The headstone (right) commemorates Margaret MacLachlan. The two Marys were drowned in the Solway tide. The three men were executed in 1685 on the orders of Major Windram. John Milroy was a hawker on Fyntalloch estate. Walker was a servant at Kirkcalla farm (NX 305747). Johnstone was the gardener at Fyntalloch estate (NX 303738). The house no longer exists.